American maternal mortality rates rose over a 20-year period at a rate that places the U.S. in the company of war-torn countries like Afghanistan and impoverished nations like Chad and Swaziland, according to a new report. The findings were recently published in the Lancet by the Institute for Health Metrics and Evaluation, a global health research center at the University of Washington. They comprise over 20 years of maternal health data from around the globe. The report shows that there are 18.5 maternal deaths per 100,000 live births in the U.S., up from 12.4 deaths per 100,000 births in 1990. Dr. Nicholas Kassebaum, the lead author of the study and a pediatric anesthesiologist at Seattle Children's Hospital, said the findings show that America has a long way to go when it comes to identifying and caring for women at risk of pregnancy-related complications. 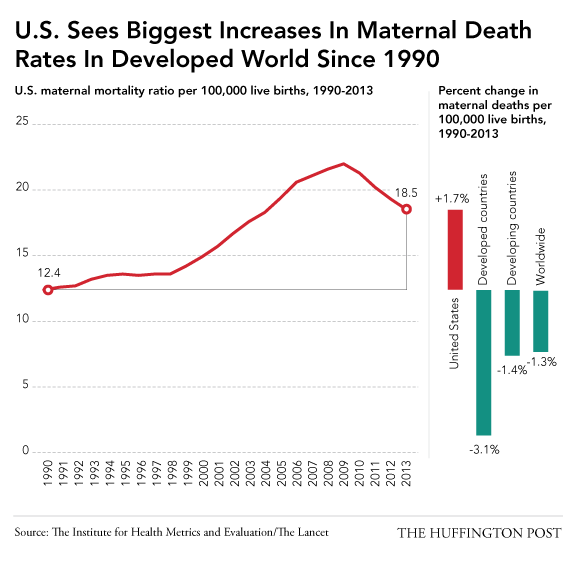 "In the global context, yes -- the United States has a low maternal mortality rate," Kassebaum told The Huffington Post. "But we rank 60th in the world, and below virtually every other developed nation. We're close to triple the rate of the U.K. and eight times that of Iceland, the world's leader." 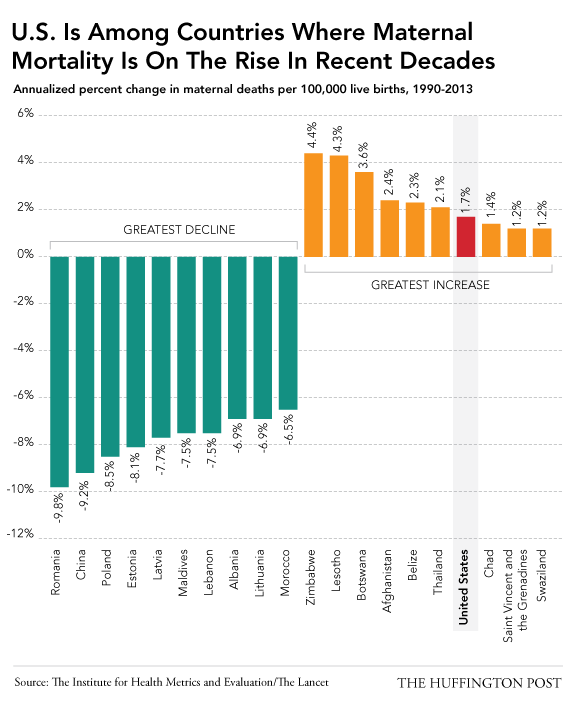 Globally, there has been a decrease in maternal mortality rates. But eight countries are bucking that trend, and the U.S. is the only developed nation among them. The reasons for this American aberration are complex, systemic and political, according to Rachel Ward, the director of research for Amnesty International USA and the author of the 2011 report "Deadly Delivery: The Maternal Health Care Crisis in the USA." "Many of these deaths can be prevented, and that's what makes it a human rights issue," Ward, who was not involved in the Institute for Health Metrics and Evaluation report, told HuffPost. "We're not waiting for a medical breakthrough -- what we're waiting for here is the political will to save these women's lives." 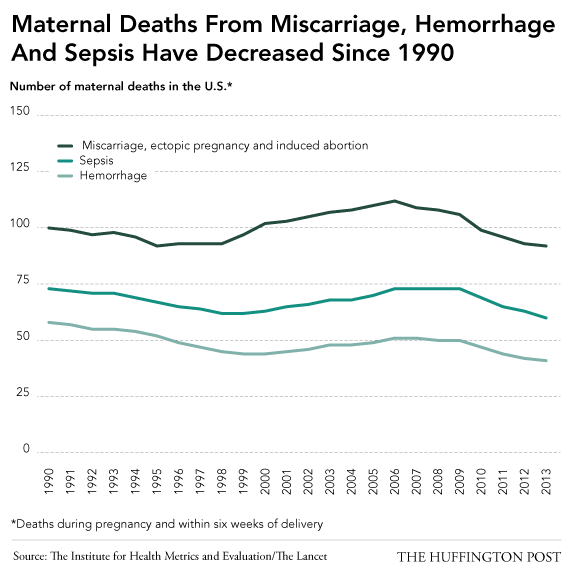 In the U.S., deaths from hemorrhage, sepsis (infection) and abortion (the medical definition of which includes ectopic pregnancy, miscarriage and induced abortion) are on the decline, according to the report. 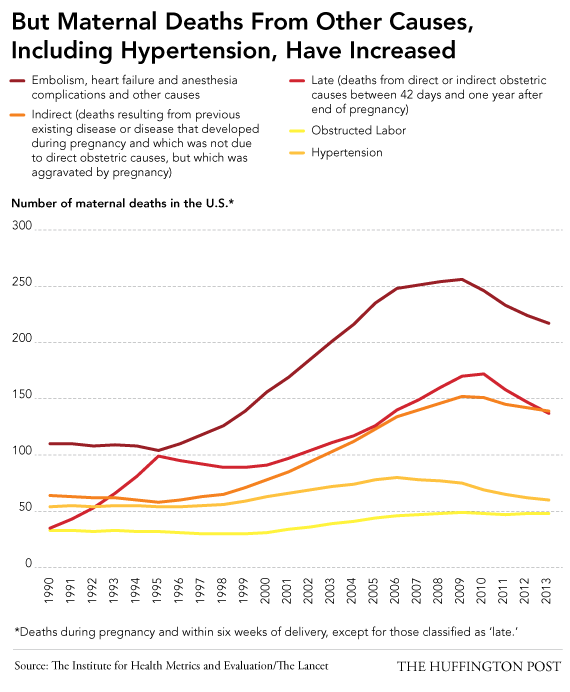 But deaths from medical complications that were either exacerbated by pregnancy or started during pregnancy -- things like congenital heart disease, diabetes, obesity and kidney problems, are on the rise. So are combined deaths from embolism, heart failure and anesthesia complications. Ward said the data in the Institute for Health Metrics and Evaluation supports what she found in 2011: One in five women of reproductive age had no health insurance, increasing their likelihood of entering pregnancy with unmanaged diseases. Some experts noted that the rise in death rates may not be solely the result of medical inattention and lack of access. The Centers for Disease Control and Prevention, for instance, suggests that perhaps better reporting may have something to do with the jump. Computerized data could also add up to more accurate reporting and thus higher rates -- not an actual increase in risk for pregnant women in the U.S.
Dr. William Callaghan, the chief of the Maternal and Infant Health branch at the CDC, said he doesn't dispute that maternal mortality rates are too high in the U.S.
"I don't take any issue at all that ours is rising," Callaghan, who also was not involved in the new study, told HuffPost. "If we were below France, and we were at this rate, it would still be too high." "It reflects, in many ways, the health of our population," Callaghan continued. "We have a birthing population that is on average older [than before], and more people are coming into pregnancy with obesity, high blood pressure and other cardiovascular risk factors." Callaghan noted that women with lifelong poor nutrition and long histories of type 2 diabetes are also at risk of maternal medical complications -- issues Ward attributed to a lack of health insurance. But the rising numbers may also reflect medical advances, Callaghan pointed out. For instance, women who were born with congenital heart defects are getting life-saving surgeries during childhood that allow a normal quality of life, including the ability to have children. Pregnancy could add strain to their hearts, upping the risk for a cardiovascular event during pregnancy or labor. The same could be said for childhood cancer survivors, organ transplant recipients and women with AIDS, reported the Los Angeles Times -– in previous generations, some of these woman may not have reached child-bearing age, or would have been too unwell to have children. Women are also having more caesarean sections. Pregnancy increases the risk of a blood clot -- and pelvic surgery also ups that risk. About 32 percent of American births in 2012 were via caesarean section, while the World Health Organization recommends that number range from 10 to 15 percent to avoid complications for mother and baby, as well as cut down on healthcare costs. But other industrialized countries also have high c-section rates, as well as successful medical interventions that are helping women with pre-existing conditions get pregnant. What is it about the U.S. that makes pregnancy more deadly? It all comes down to health care access, reporter and author T.R. Reid wrote to HuffPost in an email, echoing Ward's conclusion. Reid was also not involved in the new study, but his 2008 documentary "Sick Around The World" and his 2009 book The Healing of America: A Global Quest for Better, Cheaper and Fairer Health Care examined the pitfalls and perils of trying to gain access to affordable care in the U.S. compared to other nations. "In all the other industrialized democracies -- every woman has access to free or low-cost medical treatment," Reid said. "As of May 2014, we have about 40 million people without health insurance; half are women." "Those women can't afford the pre-natal care that would keep them and their babies healthy after delivery," Reid continued. "Thousands of times every month in the U.S.A., women show up at an emergency room nine months pregnant, seven cm. dilated, and they've never had a pre-natal visit. Those are the women and babies we lose after childbirth." Obamacare will make up some of this loss, Reid said, since it expands Medicaid eligibility and requires insurance companies to cover preventive treatments like annual well woman visits, screening for gestational diabetes and testing for STIs and HIV. But even several years after Obamacare takes full effect, 30 million people will still be without insurance, according to a 2013 analysis. And they'll mostly be people between the ages of 18 and 44 years. CORRECTION: A previous version of this story said Obamacare would expand Medicare, not Medicaid. We regret the error.